This tutorial shows how to host a web API inside a console application. ASP.NET Web API does not require IIS. You can self-host a web API in your own host process. New applications should use OWIN to self-host Web API. See Use OWIN to Self-Host ASP.NET Web API 2. In the Templates pane, select Installed Templates and expand the Visual C# node. Under Visual C#, select Windows. In the list of project templates, select Console Application. Name the project "SelfHost" and click OK. In Solution Explorer, right-click the project and select Properties. 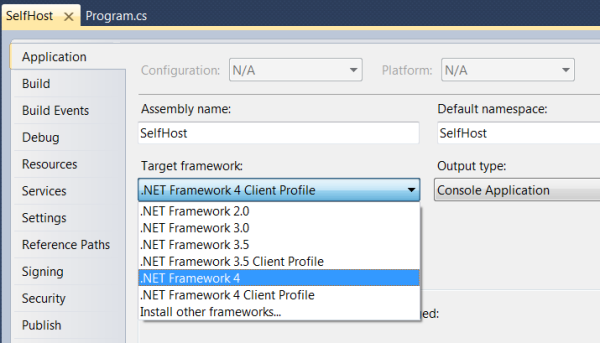 In the Target framework dropdown list, change the target framework to .NET Framework 4.0. When prompted to apply the change, click Yes. The NuGet Package Manager is the easiest way to add the Web API assemblies to a non-ASP.NET project. 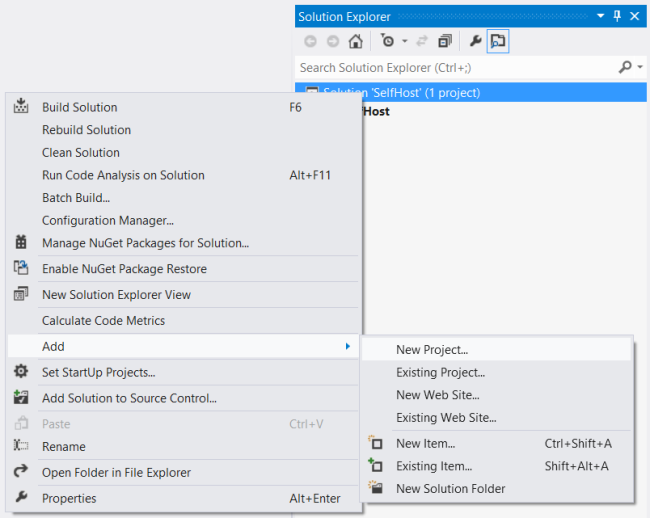 To check if NuGet Package Manager is installed, click the Tools menu in Visual Studio. If you see a menu item called NuGet Package Manager, then you have NuGet Package Manager. From the Tools menu, select Extensions and Updates. In the Extensions and Updates dialog, select Online. If you don't see "NuGet Package Manager", type "nuget package manager" in the search box. 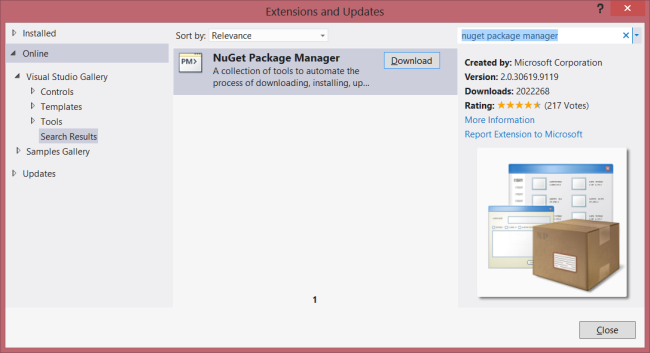 Select the NuGet Package Manager and click Download. After the download completes, you will be prompted to install. After the installation completes, you might be prompted to restart Visual Studio. 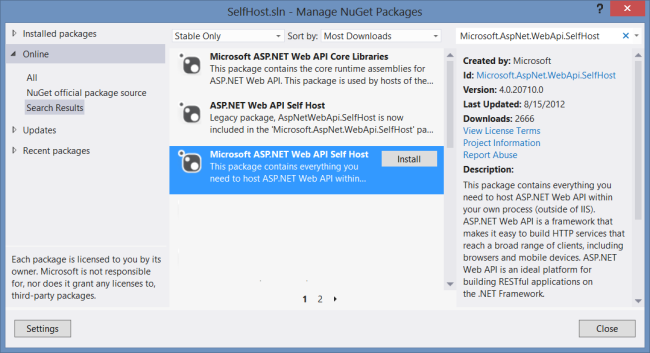 After NuGet Package Manager is installed, add the Web API Self-Host package to your project. From the Tools menu, select NuGet Package Manager. Note: If do you not see this menu item, make sure that NuGet Package Manager installed correctly. In the Manage NugGet Packages dialog, select Online. 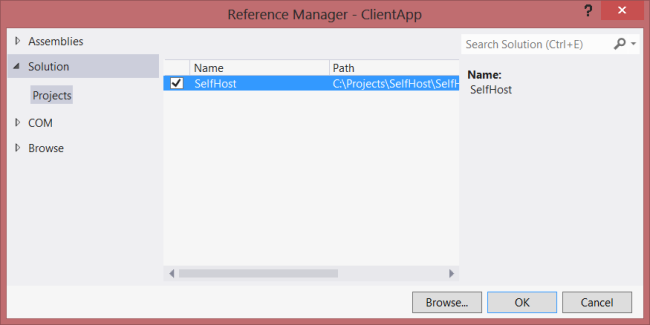 In the search box, type "Microsoft.AspNet.WebApi.SelfHost". Select the ASP.NET Web API Self Host package and click Install. After the package installs, click Close to close the dialog. Make sure to install the package named Microsoft.AspNet.WebApi.SelfHost, not AspNetWebApi.SelfHost. This tutorial uses the same model and controller classes as the Getting Started tutorial. Add a public class named Product. Add a public class named ProductsController. Derive this class from System.Web.Http.ApiController. /api/products Get a list of all products. /api/products/id Get a product by ID. /api/products/?category=category Get a list of products by category. Add the following code to the Program class. Use Netsh.exe to give your account permissions to reserve the URL. where machine\username is your user account. Let's write a simple console application that calls the web API. In Solution Explorer, right-click the solution and select Add New Project. Create a new console application named "ClientApp". From the Tools menu, select NuGet Package Manager. In the Manage NuGet Packages dialog, select Online. In the search box, type "Microsoft.AspNet.WebApi.Client". 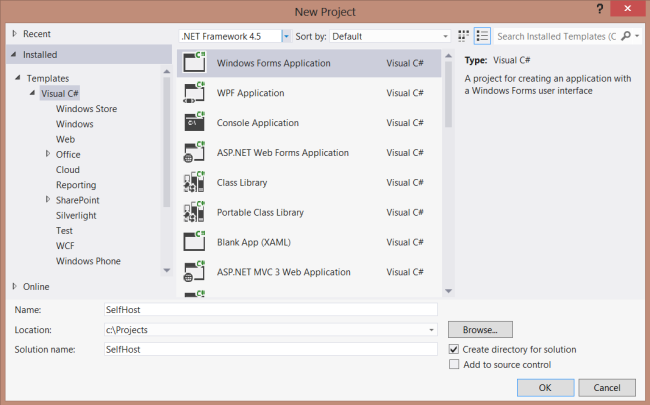 Select the Microsoft ASP.NET Web API Client Libraries package and click Install. In Solution Explorer, right-click the ClientApp project. In the Reference Manager dialog, under Solution, select Projects. Add the following methods to list all products, list a product by ID, and list products by category. Call HttpClient.GetAsync to send a GET request to the appropriate URI. Call HttpResponseMessage.EnsureSuccessStatusCode. This method throws an exception if the HTTP response status is an error code. Call ReadAsAsync<T> to deserialize a CLR type from the HTTP response. This method is an extension method, defined in System.Net.Http.HttpContentExtensions. The GetAsync and ReadAsAsync methods are both asynchronous. They return Task objects that represent the asynchronous operation. Getting the Result property blocks the thread until the operation completes. For more information about using HttpClient, including how to make non-blocking calls, see Calling a Web API From a .NET Client.